This story begins almost a year before I even got the boat. I had seen the poor thing sitting in a friend's back yard. 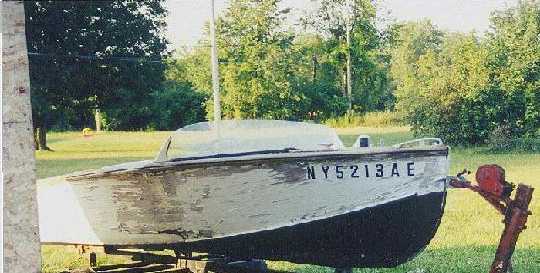 He was a wooden boat fan and had gotten it for a project of his own. He never got around to starting it, so it sat in his yard under a tarp. After looking at it every time I was at his house, I finally mentioned to him that if he wasn't going to work on it, I'd like to buy it for my 1st venture into wooden boats. After talking about it a number of times, we agreed on a price, then it was forgotten for some time as we were both pretty busy. About two months later, I found out that my girlfriend had bought the boat for me and he was bringing it to my house that weekend! I was ecstatic when it arrived! I cleaned all the leaves and miscellaneous trash out of the boat and started making a list of needed items. Unfortunately, it was now early fall in upstate NY, so it would have to wait for next Spring. I removed all the seats, put them inside and covered up the little boat for the Winter. Forward to mid March of '99. Spring came a little early this year, so off came the cover and the work begins. At first, the damage didn't look that bad. Here' a few pics of the boat in "as found" condition. I figured some new plywood, a few replaced boards, and a little transom repair would get her ready for paint. 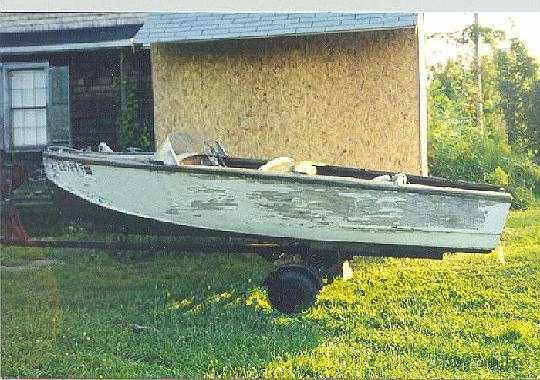 I began by removing the windshield and all the topside hardware, then flipping the boat over onto a few saw horses. Then I removed the side plywood, which revealed some hidden rot in the chine rails. Next the bottom came off and more rot was found on the underside of the ribs. The job was getting bigger every day! Once I had it stripped down to the frame, I found that all but one of the frame sections ( one piece of the forward most rib ) would need to be replaced. At this point, I had reached a crossroads. Either hang it up now and look for another project, or take it all the way and make this a "pattern" boat. I already had my mind made up before I finished that thought. Off to the lumber yard! There was just something about this particular boat. I'd never seen one like it ( I still haven't to this day! ). New England Hardwoods in Pine Plains, NY became a regular stop for materials. I decided I wanted a sturdy, cruising boat, as opposed to a lighter " race " style hull, so I went with white oak for all the framing. It's a little heavier than mahogany, but the weight makes it more stable in the sometimes choppy Hudson River where most of my boating will be done. The 3/4" oak makes up all the ribs and the chine rails, 5/4" for the keel, and the new stem was made by cutting the oak into 1/4" thick strips, then steaming them, and laminating them together around a form that matches the curve of the original stem. 12 layers of the 1/4" oak were laminated onto the form with West System epoxy. I thought long and hard about what to do with the transom. The original was one solid piece of 5/4" mahogany and had warped some. I decided on 1" mahogany marine plywood with 3/4" mahogany laminated to the outer face for strength. The transom was assembled, trimmed for final fit, and installed with the original keel still in place for correct angle. The transom knee was made from 2 pieces of the 1" mahogany plywood laminated together. 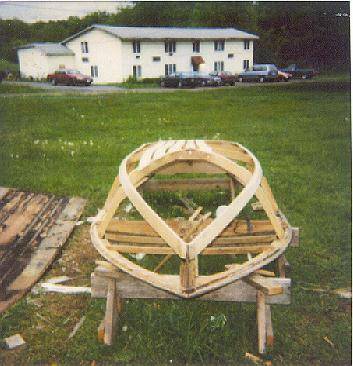 I carefully cut the boat ID# out of the old knee and grafted it into the new one. Now onto the frame. Once the ribs were assembled, also with West System using the originals for a pattern, they were positioned on the boat and the chine rails were steamed and bent into place. Next comes the all so wonderful task of planing the edges of the rails to match the contour of the bottom and sides. I did the first one by hand (LOTS of work), then opted for borrowing a power planer from a friend. The keel was installed and planed, then came the battens. The original battens really weren't in bad shape, but I figured with everything else new, why not. I made the new ones 1/8" thicker than the originals and trimmed the notches for them in the ribs an equal amount deeper. I forgot to mention, through all this, the only thing holding the original shape of the boat is the topside mahogany. I constantly checked, and re-checked, to make sure the shape stayed true and level. Here's where we're at now. The stem was then notched to accept the keel, installed, and planed to the contour of the bow. After measuring, tweaking, trimming and checking again, the frame was ready for plywood. I had decided on a stained/varnish finish for the sides, so they would be mahogany plywood, and fir plywood on the bottom, both marine grade. A trip to Boulter Plywood, just north of Boston, Mass., supplied three 4'x8'x3/8" sheets of mahogany and one 4'x16'x3/8" sheet of fir plywood. Actually, this trip took place much earlier in the project. A friend also need some marine plywood for his own boat project, so we went and picked up everything to save on shipping costs. I got the 1" marine mahogany plywood for the transom here too. Because the bottom wood flares out to cover the edge of the side wood, the bottom went on first. Luckily, the old bottom wood, rotted as it was, came off in pretty much one piece. I used this as a general pattern, leaving extra room all the way around for trimming it to a perfect fit. The problem with a one piece bottom, is the amount of bending required to fit the wood. I couldn't think of a feasible way to steam a 4' wide piece of plywood, so I started at the transom, working my way to the bow with cabinet straps pulling the wood into place. A little water from a spray bottle helped on the severe bends. This process took three full days of tightening the straps little by little to bend the wood, until the proper contour was achieved. The last day being just to let it sit and relax into the new shape a bit. Then the bottom was trimmed to fit, removed, and then replaced permanently with Boat Life caulk and screws. The sides were more involved. The mahogany plywood wasn't available in 14' lengths, so I had to join the shorter sections end to end. I've never had to splice together wood this thin, and it shows in the finished product. Unfortunately, the jig I made to secure the scarf joint didn't completely squeeze the center of the joint. It's a sturdy joint (West System again), but a lot of the epoxy showed after the joint was sanded flush. I didn't have enough extra length to re-splice the wood, so that's the way it stayed. I hoped the stain would cover the mistake enough to make it less obvious. The old sides were also rotted worse than the bottom, so using them for patterns was a crap shoot at best. I got the top contour off the old sides and trimmed the rest to fit once it was on the boat. I turned to the cabinet straps again for bending the sheet around the bow and repeated the process of bend, let sit, remove, caulk, replace, and screw it in. With the plywood all trimmed and ready, I decided to add a barrier coat of West System epoxy to the whole bottom. I filled all the screw holes, built up a few low spots, and sanded the whole bottom, up to the water line, with #80 on a d/a sander. Next the first of two coats of epoxy was applied with a foam roller. After drying, sanding again, and applying the second coat, I cleaned the surface in preparation for the VC17 copper bottom paint. One thing I overlooked (read: boy did I screw that up) was the fact that the epoxy develops a blush as it cures. This is a powder like coating that can be removed with a water wash. I'll cover this snafu later. On to the sides. Both sides, along with the outer transom, were sanded, then stained with Petit Dark Mahogany Filler Stain. This is where the scarf joint problem comes into play. The messed up joint was blazingly apparent! I tried to feather and blend it together, ended up only making it worse. I decided to cut losses and deal with it the way it was. I lightly sanded the sides and re-stained them. Then the varnish, Interlux Schooner, Classic High Gloss. I only put on three coats at this point. I wanted to wait for the rest until I had it flipped over and there was less chance of damage.